Rooftops of houses in the Kitsilano neighbourhood and the downtown core are seen in Vancouver. Sales have tumbled in Canada’s two most expensive housing markets as buyers and sellers sit on the sidelines waiting to see whether each region is heading toward stability or continuing volatility. Residential sales volume last month fell 22 per cent in the Greater Toronto Area, compared with May, 2017, while the number of properties changing hands in Greater Vancouver dropped 35 per cent. The benchmark price for residential properties in Greater Vancouver rose to a record $1,094,000 last month, despite the decline in sales volume. The benchmark price is an industry representation of the typical home sold in an area. 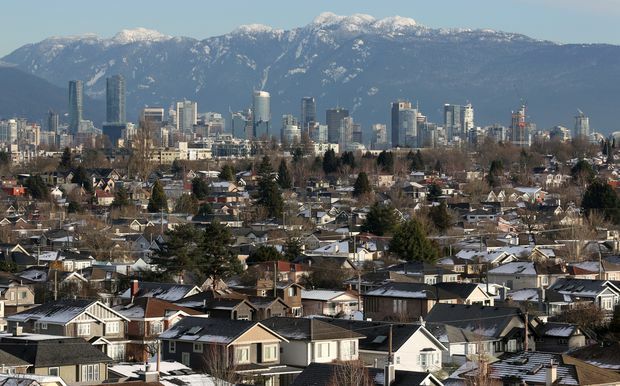 “The scale of the housing policy changes so far is not large enough to fundamentally change the dynamics in Vancouver,” said Alex Hemingway, public policy finance analyst at the Canadian Centre for Policy Alternatives. In its February budget, the BC NDP minority government announced a variety of measures designed to reduce home prices, including what it calls a speculation tax imposed on out-of-province residents and an increase to the school tax, affecting the portion of the value of a property assessed above $3-million. The NDP also increased the B.C. tax on foreign buyers to 20 per cent from 15 per cent in the Vancouver region and expanded it to other urban areas of British Columbia. The former BC Liberal government implemented the tax in August, 2016, while Ontario imposed its 15-per-cent foreign-buyers tax in April, 2017. Federally, a stress test imposed this year by Canada’s banking regulator has reduced the amount that borrowers qualify for and slowed demand for real estate. Sales in the Vancouver area decreased 35 per cent to 2,833 transactions last month, marking the lowest level for May since 2001. Still, last month’s record-high benchmark price in the region was up 11.5 per cent from May, 2017, the Real Estate Board of Greater Vancouver said in a news release. “With fewer homes selling today compared to recent years, the number of homes available for sale is rising,” board president Phil Moore said. The price for detached houses sold in the Vancouver region averaged $1,786,580 last month, down 2.4 per cent from a year earlier. Average prices for condos have risen 10 per cent to $722,566 over the past year. In the GTA, taxation is a hot topic, as it is in Greater Vancouver. GTA residents want the next Ontario government to reduce the land transfer tax and focus on policies that increase housing supply in the region, according to a poll from the Toronto Real Estate Board. The Ipsos survey found 77 per cent of GTA residents support reducing the provincial land transfer tax and 68 per cent support repealing it entirely, TREB said. The poll also found 69 per cent of respondents agree that parties’ platforms on housing affordability will influence their voting decisions and 56 per cent believe the government should focus equally on increasing the supply of housing and reducing demand for housing. TREB released the findings on Monday as it reported a 22-per-cent drop in the number of homes sold in the GTA in May compared with a year earlier and a 26-per-cent decline in new listings of homes for sale, both signals that many people are still on the sidelines waiting for evidence of a recovery in the weak GTA market. The decline in listings is helping keep prices stable despite weak sales, TREB said, with the average selling price rising 1.1 per cent in May compared with April on a seasonally adjusted basis. Compared with May last year, prices for homes of all types were down 6.6 per cent last month. Jason Mercer, TREB’s director of market analysis, said indications are emerging that there is increasing competition and bidding wars for available homes, which generally leads to price growth. Although home prices have fallen since last spring, the region remains expensive for many buyers. Sale prices averaged $805,320 in the GTA in May, down from $862,149 in 2017. Condominium prices are up 5.7 per cent on a year-over-year basis to an average of $562,892, while detached home prices on average are down 8.2 per cent to $1,045,553.